As I mentioned some fifteen years or so ago, my imaginary friend Ishmael Gradsdovic has a tapeworm that is clairvoyant, that speaks with him telepathically, and that is capable of conducting interviews with dead celebrities who communicate from the great beyond. I thought I would take advantage of this and see if I could arrange an interview with Aristotle in the hopes that he could clear up some of his aggravating comments about the institution of slavery. 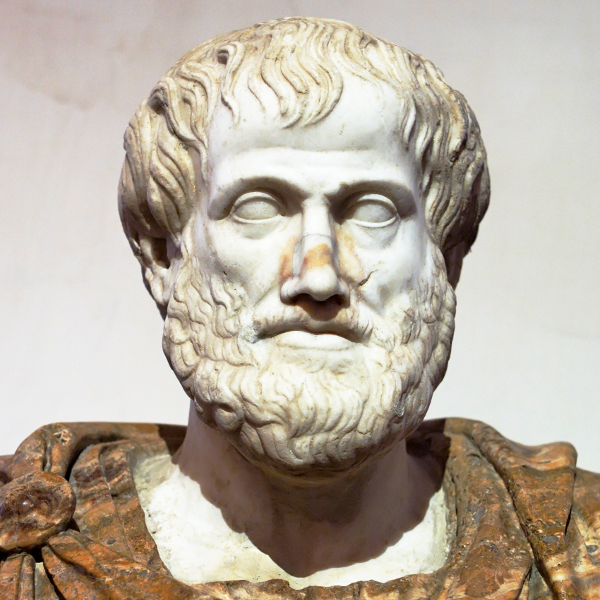 It’s an honor to have you with us on The Picket Line , Aristotle. It’s a delight to be able to speak with you more than 2,300 years after my death. I’ve been reading through your Politics and if I could, I’d like to ask you some questions about slavery. In my time we have concluded that it is absolutely unjustifiable to enslave people. So it’s difficult for us to understand your seeming lack of concern for the ethical violation it is to make another person into your slave, and this also makes it difficult for us to appreciate your other arguments. There were those in my day who felt much the same as you do. But when I looked around me I saw slavery practiced wherever I looked, and I figured it was just part of the human condition. I thought it wiser to describe the contours of human society as I found them rather than trying to justify some theoretical system dreamed up by idealists. So your society does not practice slavery at all then? I have been trying to familiarize myself with your culture from my distant vantage in Elysium, but I find it puzzling in many ways. We used to have slavery, but not any more. Long story short: there was a lengthy struggle that included both philosophical argument and eventually civil war and the outcome was that we made it illegal to enslave people. A similar story played out in many other parts of the world, and now slavery is mostly abolished and is almost universally discredited. What a fascinating development! Who then takes the place of slaves in your households? We have replaced slaves with employees, so that those of us who desire additional household workers find them among free people and pay them a wage to do the work. But those people that you hire, do they then hire servants of their own in their households, and then whom do they hire? Wouldn’t this eventually go in a circle where every one is free but everyone hires himself out as a servant in another person’s house? [I]f every instrument could accomplish its own work, obeying or anticipating the will of others, like the statues of Daedalus, or the tripods of Hephaestus, which, says the poet, “of their own accord entered the assembly of the Gods;” if, in like manner, the shuttle would weave and the plectrum touch the lyre without a hand to guide them, chief workmen would not want servants, nor masters slaves. We now have many instruments that play themselves, at least to a great extent, and so most of us do not have as much need for household help. Remarkable! Who wove your clothing for you? Was it one of your self-weaving looms, or one of your household employees, or did you perhaps do it yourself? I’m not actually sure. Most of my clothing is purchased from traders who import it from manufacturers in other countries and so I never see which people or instruments make them. And in these countries, too, everybody is free and there is no slavery? I wouldn’t swear by that. There’s probably not much outright slavery as we would typically use the word, but things may be in more of a gray area. It may be that the workers’ choices are restricted and they’re subject to retaliation if they complain or quit and their pay is less than they would accept if they were truly free. Ah. So ideals remain difficult to attain in practice even in your day. And what of those whom you capture in war. What do you do with them if you do not enslave them? Well, they can be put to work. For instance, when we fought a “World War” seventy-five years ago, we took hundreds of thousands of prisoners captive and put them to work in labor camps in our country, doing agricultural work for instance. But they weren’t exactly slaves. They were paid money for their labor, about 50–75% of what free people would earn, and the officers among them could not be compelled to work. After the war was over they were allowed to return to their homes. We have international treaties that forbid making slaves of prisoners of war. Fascinating. And what about those who break your laws or in other ways violate the peace of the polis? Do you not put them in bonds? Well, yes. And it’s true that they are often put to work as well. They are paid for some of their work, but it’s usually only a token amount, and they can be retaliated against by those who hold them captive if they refuse or complain. And the prisons have a monopoly on what the prisoners can spend their wages on, and use this to inflate the prices and thereby further reduce the value of these wages. This is probably the closest thing we have to slavery (outside of wartime when we sometimes conscript male soldiers). In California, for instance, prisoners were paid $1 per hour to perform grueling, dangerous work fighting wildfires recently, a tiny fraction of what free people would have accepted to do that work. If your philosophers have determined that it is absolutely unjustifiable to enslave people, and if you have even gone to war to defend that principle, how is it that the sorts of things you have been describing are still tolerated? Well, people generally consider it not to be really slavery if people are paid at least something for their work, and if they have some choice as to whether or not to work at all. And lots of people think that what would be considered unjustifiable slavery when applied to an ordinary citizen is a just punishment and possibly a useful form of occupational therapy when applied to someone who has been convicted of a crime. And some countries have less-developed labor standards and need time to mature into a more decent respect for human rights, and so we cut them some slack when deciding whom to trade with rather than shunning them outright. Myself, I’m not convinced these justifications are adequate, but they are common. Then it doesn’t seem like we are as far apart in our beliefs as I had originally supposed. I too thought that it was unjustified to make a slave out of an ordinary Greek citizen, but only thought that those who had demonstrated that they had insufficient capacity to reason should be enslaved, and then only for their own benefit. As for non-Greeks, I felt much as you do about your less-developed nations: that they did not really demonstrate the same standards as we did and so were unlikely to be harmed much by enslavement. And I too looked at the common justifications offered by slaveholders around me and tried to discern the reason in them. Well, it’s not really in the same ballpark, is it? In your time, one polis may raid a smaller, weaker one and carry away all of the survivors from the conquered polis to be slaves for life. Or pirates may raid a village or seize a ship and make slaves of everyone they find, to be sold in the marketplace like property. We have nothing of that sort any longer. Nobody can be made anyone else’s permanent property. In Hades I had the opportunity to speak with one of your countrymen from Missouri, who lived a century and a half or so before your time, and he made a similar argument. He told me that the slaves in his area were free to go to religious services on Sundays, and on Saturdays the custom was to allow them to sell their labor to whomever they chose and to keep the wages for themselves. He contrasted this system with the cruel and unjustifiable slavery practiced without respite, seven days a week, in less-enlightened parts of your country at that time, and with the Greek slavery that I had taken pains to justify. I could not see any fundamental differences between their practices and ours, only cultural variations in what was considered appropriate, and I admit I am finding myself at a similar loss in your case. Let me try again. You believed, and perhaps still do, that some people are born slaves. That is, that nature never intended for them to develop into the sorts of rational creatures who ought to make their own decisions about their destinies, but intended them to be put under the mastery of those whom nature has endowed with such faculties. Yes, natural slaves are much like women in that regard. Yeah… that’s a whole ’nother discussion I’d like to have with you at some point. But before I forget my train of thought: a big difference between our cultures is that we reject the idea that some of us are born to command and others to obey. We believe that “all men are created equal” at least as far as it comes to our right to life, liberty, and the pursuit of εὐδαιμονία. It’s one thing to temporarily sentence someone to a restriction on their liberty because of a specific crime they have been convicted of, and quite another to sentence them to a lifetime of property-status based on an assumption that they are a non-reasoning subspecies of human. I see what you mean. So in your time all human beings both recognize and possess reason? On the contrary: Hardly anyone does. Ah. I think I’m starting to understand. Have you considered the possibility that you haven’t abolished slavery and made everyone free but have instead abolished freeness and made everyone a slave? Look at the schools of your polis, for instance. Do they train children in the complete virtues of free men, or do they mostly teach a set of valuable skills for workers? Hmmm… I see what you mean. Or look at the way in which you commonly become acquainted with one another. One of the first things you ask is “what do you do?” and the response usually takes the form of “I’m a such-and-such for so-and-so.” In other words, you describe yourself in terms of what sort of tool you are for which master. This is how slaves greeted each other in my time. But you had employees in your day as well, didn’t you? And you didn’t consider them to be slaves. I did consider them to be slave-ish for the duration of their working day. They were hiring themselves out as temporary slaves, because while they were working they were only exercising the virtues of laborers, not the more complete virtues of free men. If they were to define themselves by the labor they performed for their employers, I would consider them to be defining themselves to be slaves and ignoring their potential to be free and virtuous men. But what’s worse in your society is that many such wage slaves do not have any sort of personal relationship with their masters; they only work for “corporations.” These corporate golems are like masters, but without rationality or virtue; their motives are purely financial. So you lose the one great advantage of being a slave: that of being directed by someone more rational and virtuous than yourself. Your corporate masters are an invention somewhat like your automated looms, but it is as though you have made an automated loom that only makes clothing that is uncomfortable to wear: you have created automated masters who are even less virtuous and less rational than their slaves. Your governments take this corporate form too, often, so that instead of being associations of free men as I had anticipated, or even tyrannies or oligarchies, your governments are instead the rule of a variety of automated loom which the slaves, having triumphed over their masters, have enthroned in the masters’ place. I have yet to see the advantages of this approach. Well, this conversation has gone in a very different direction from what I expected, but I take that as a sign that it has gone well. I thank you for sharing your impressions with us, and I suppose I shouldn’t be surprised that I couldn’t out-argue Aristotle even on what I thought was a slam-dunk case like slavery. I’m glad we could have this conversation. I’m always eager to learn from different cultures and practices, and if you ever put your utopian ideal of abolishing slavery into practice, I’ll be excited to see how it turns out. Aristotle thought some of us were born to be slaves and others born to be masters, and it’s to the mutual advantage of each that we come together to play off each others’ strengths in order to accomplish our goals, which we can best do if the masters command and the slaves obey.